If you're on the lookout for a gas inflation life jacket that will suit you for coastal or inshore use, day cruising or even as a backup for visiting crew members, our popular Cruise Manual Lifejacket will certainly do the trick. Even though it's lightweight, this 150-newton life jacket conforms to both CE EN396 and ISO12402 ratings meaning you can be assured of product quality. Best of all, unlike other brands, these are made here in the UK. You can expect all the features you would want from a 150N lifejacket - self-righting bladder (turning you face up in the water), oral inflation tube, emergency whistle, fluorescent tape, and reflective hemming. 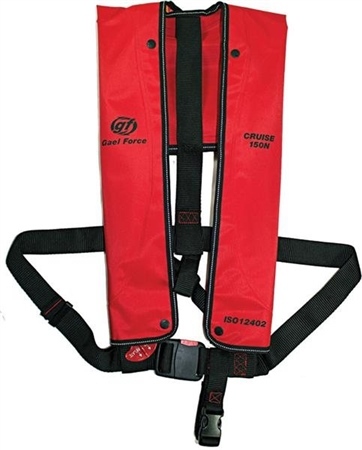 This lifejacket comes with a 3-Year Warranty and includes a free crotch strap worth £3.99. Lightweight jackets very good value. from ordering to delivery quick and reliable.